The Case in Greenwood: Why America Deserves Its Retail Blight. The local media thoroughly covered the City of Greenwood’s announcement that it had finally secured a developer for the site at the southeast corner of the I-65/County Line Road interchange—a tract where numerous proposals had come to light, most prominently featuring a Cabela’s. But, time and time again, none had materialized…part of the aftermath of the sour economy. Well, as of October 28, Gershman Partners announced its plans to develop the tract into over 700,000 square feet of retail. I hate to create such a negative-Nancy blog post, but you can already tell where I’m going with this. Greenwood may be growing at a decent clip, but it’s not Fishers, let alone Gilbert, Arizona. Without doing the math, I speculate that it’s in the top 30% of all counties, when ranked by population growth. Commendable, but hardly formidable. So why does Greenwood need a new shopping district more than half the size of the regional mall, which sits just two miles away? It doesn’t. History has proven time and again that, as soon as one new development opens its doors, another one within a five-mile radius begins a steady and generally incorrigible decline. So, once the Gershman proposal ushers in its new tenants, how many will be genuinely new to the region, and how many will simply migrate to the shiny shopping Shangri-La? Here’s a map of Greenwood with the proposed development site (indicated by a blue asterisk), as well as four other commercial nodes, ranked from what I perceive as most to least vulnerable to “retail cannibalism”. It doesn’t take much to speculate how market machinations will affect the environment. Node #1: The retail regiments on the “front lines” of the assault are, unsurprisingly, the ones closest. Just on the other side of the County Line Road/I-65 Interchange, at County Line and Emerson Avenue, sit two other shopping centers: one fairly old on the Indianapolis side, with a Kroger as the anchor, then two on the Greenwood side, with Walmart, Gander Mountain and Goodwill as respective anchors. Of course it’s possible that these tenants are in long-term leases at their current locations, but what’s to stop them from breaking those leases if they think they can recoup their costs by shifting to a fresh new building that will attract people simply out of novelty? We’ve also seen examples where Walmart does this, abandoning its 1980s-era, blue-gray outlets for a newer, bigger supercenters a mile down the road. 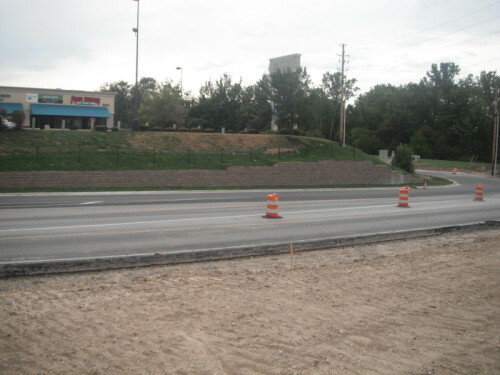 And, from the looks of things, it’s already underway: based on an August 2015 Google Street View, Kroger is breaking ground on a new site at the northeast corner of County Line and Emerson, directly across the street from the old location on the northwest corner. Once construction is complete (if it hasn’t finished already), Kroger will inevitably close the old location, leaving yet another underutilized strip mall with orphaned in-line tenants…most of whom will undoubtedly look to relocate to a more lucrative location. Greenwood Town Center, perhaps? Node #2: The busy intersection at Southport Road and Emerson Avenue hosts shopping at all four corners, but the strip mall on the northwest corner is the largest and probably the most vulnerable. Southport Commons features several major anchors, along with another dozen in-line tenants and outparcels. This node also attracts a considerable number of downtown dwellers, whenever they need big-box shopping at Target or one of the others. It’s just a 12-minute car trip down I-65 to this busy retail intersection. The visibility of these storefronts is far superior to their access, exclusively on the overloaded Emerson Avenue, with awkward ingress points like this one. Despite the problematic site design, the shopping hub still thrives, thanks to stability of the tenants in the area. We’ve got Menards and Meijer, the Midwest’s powerful competitors to Home Depot and Walmart, respectively. Target is already spoken for; Home Depot is there too. But, in the area of floundering J.C. Penney and Macy’s, Southport Commons also claims what has my vote as the most consistently well-managed national department store chain. Kohl’s is another quintessential Midwestern stalwart: low-key, unassuming, resilient. But the leadership at Kohl’s is particularly shrewd about where to locate their outlets, usually not directly affiliated with conventional malls, but often very close by. The proposed Greenwood Town Center would kill for a tenant like Kohl’s, but it would probably come at the cost of the one in Southport Commons, just two miles away. The last and subtlest vulnerability of this shopping hub is that Emerson Avenue also serves as a township line, and to the west of Emerson is Franklin Township, an overwhelmingly residential jurisdiction within the Indy city limits that has very little taxable commercial properties in its boundaries. Thus, residents must pay particularly high taxes to support the Franklin Township Metropolitan School District, and the departure of a major player like Meijer, Staples or even Panera Bread would only exacerbate the situation. While it has been the choice of Franklin Township residents to maintain a “rural quality” at a relatively high cost, they would likely have little say if the few retail tenants on their side of Emerson Avenue fled south to this new development. 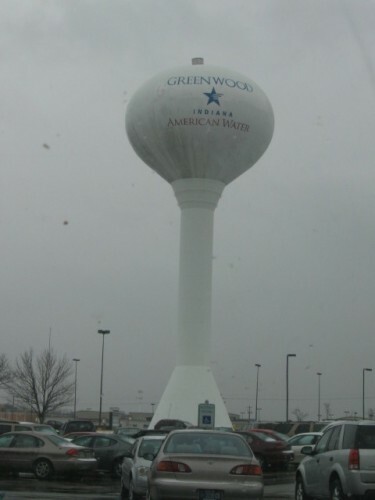 Node #3: This is the granddaddy of them all: Greenwood Park Mall, the site of a shopping district since the 1960s and fully “mollified” in 1980, is one of the five largest in the state, at nearly 1.2 million square feet of space. Needless to say, its retail tentacles extend far beyond the southeast corner of U.S. 31 and County Line Road, but the highest concentration of activity remains at this prominent site. For those of you who aren’t as obsessed with mall culture as I am, 1) good for you! and 2) you don’t know how significant Greenwood Park Mall is, when placed in a regional or even a national context. I extolled its virtues in two blog posts way back in 2010, and, though I’m not in Indy much these days, I feel confident that it’s still chugging along nicely. The powerhouse mall has five anchor tenants—six if you count the Barnes and Noble in the outdoor portion—and all are occupied. In this day and age, that is an achievement in and of itself: many malls with space for four anchor tenants have at least one vacancy. Not only that, while its counterparts Lafayette Square and Washington Square have fallen into oblivion, Greenwood Park has actually grown more powerful and even slightly more upscale in recent years, claiming such tenants as Coach, Sephora, White House Black Market, and coveted restaurants like Cheesecake Factory—all of which would have been unthinkably highbrow (or at least upper-middlebrow) for this very middle-of-the-middle part of town, back when I was growing up in the 80s and 90s. A Simon Property Group mall (like just about everything in its Indy corporate headquarters), it attracts crowds from throughout south-central Indiana on weekends. It weathered the massive department store consolidation around the turn of the 21st century that resulted in the absorption of local shopping institution L.S. Ayres. It thrived when an adjacent mini-mall directly to the north (Target Square Mall) imploded after the departure of its anchor, Target. In short, it has prevailed at the level of the top 10% of malls that cater to a middle-income market. But, with the Gershman proposal at Greenwood Town Center, it will have competition two miles to the east, on the same road, at a site with much higher visibility. Although this node may be less vulnerable than the first two listed because of its sheer size and history of strong management, it would be ludicrous to assume that the new development won’t compete with Greenwood Park Mall. After all, immediately to the south of the mall is another Kohl’s. What’s to stop this successful chain from consolidating its impact by locating at the highly visible Greenwood Town Center, thereby closing both the locations at Node #2 and Node #3? Why shouldn’t Von Maur or Macy’s move, for that matter? Node #4: By far the smallest node, this offers a different retail typology than the others. Why? Because it is the real Greenwood town center—the historic main street, from when Greenwood was an agrarian satellite of Indianapolis. This two-block corridor has long sat in Greenwood’s margins—geographically, economically and in the minds of its inhabitants. The City allowed the entire southwest corner to get demolished decades ago, for a parking lot. Urban Indy has covered the iterative attempts to revitalize Main Street, like this one, with increasing sensitivity to the architectural heritage. (The earliest proposal in 2011 involved widespread demolition, placing downtown Greenwood on Indiana Landmarks’ list of the 10 most endangered historic places in the state.) 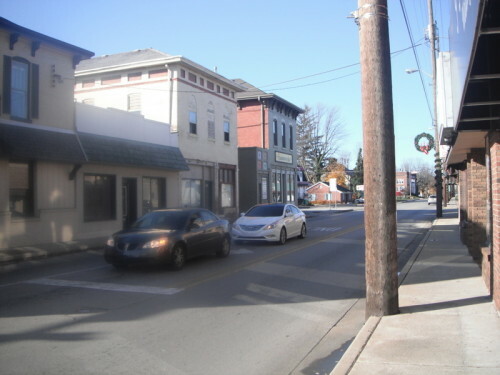 More recent plans show superior effort at preserving the rural main street character without letting the pedestrian access get subsumed by traffic planning. That’s well and good, but why would the City greenlight a faux town-center proposal that will mimic the character of a main street, at the same time that the original center of Greenwood is finally starting to assert itself as a potential southside hub for innovative local dining? Maybe Main Street Greenwood will succeed on its own right, offering locally-owned restaurant and retail options as a counterpart to the chains at Greenwood Park Mall or this new contender. But if Main Street flounders, who is willing to bet that the prevailing culture will blame it on a lack of off-street parking? In spite of all the clear evidence that this new retail proposal isn’t a good idea, I don’t intend to don these boxing gloves much longer, lest I seem opposed to competition, which is really what the Gershman proposal offers. And I’m hardly wanting to flog Gershman Partners any further; it shows all evidence that it’s a smartly run company that balances these suburbanizing mega-projects with smart urban infill, like the redevelopment around the Marott Center on Mass Ave, which Urban Indy has covered in the past. Good for them. What this proposal demonstrates, whether it succeeds or not, is a prevailing weakness in American consumer culture. America is already the most over-retailed country in the world, and it’s not just due to high incomes and comparatively lax land-use regulations. Fundamentally, Americans respond more positively to shiny new things than they respond negatively to what gets left in the wake—the abandonment. Or else they catch abandonment amnesia when the next glossy package comes along. All a retail developer needs is 10-15 years of successful tenancy to reap solid profits—which is about all they can expect when depreciation life cycles are so brief. After that, the strip mall/lifestyle center/power center will lose its luster to something newer that’s three miles down the road, and it will decline to desuetude. The developers, the chambers of commerce, the civic leaders—all the people orchestrating retail’s superfluous proliferation—they would accomplish nothing if they weren’t simply meeting the perceived demand of the average American consumer. And, to top it all off, this average American consumer is shifting ever further from bricks-and-mortar all along, as more and more people meat their goods-based retail needs on the internet. If this trend continues, nodes 1 through 4 may decline even without a new greenfield development; after all, how many restaurants and day spas can we continue to support? My strongest alternative solution in this Greenwood example would have been to push more heavily for a mixed-use result at I-65 and County Line Road, which at least would have counterbalanced all that retail with residences or office-based commercial. (It still would likely pull tenants away from the other nodes, but at least it would have contributed to a net densification of population/incomes in the region.) As it stands, the best that can be said about our relentless cycles of retail death and life is that they offer numerous options for creative reinterpretation of the landscape for generations to come. And, for all its wasteful consumerism, America also succeeds magnificently at creative reinvention. Just compare the Indianapolis Town Center—the Mile Square—from where it was twenty years ago. 1) Costco is well on its way to completion. It lies on the north side of County Line pretty much at the end of the airport runway. 2) The old Kroger is a shell and the new Kroger Marketplace is up and running. I think it had its grand opening about a month ago. As for the rest, I would say Greenwood Part Mall will suffer worst because of this new place given is the most dated of the 4 sites. The mall still looks the same as it has since the 80s in spite of some facelifts and expansions along the way. Note, I said “most dated” above because obviously Old Town is the oldest of the sites, but has quite a bit of charm assuming they don’t one-way it or try to flush more traffic through in some other way. I think Emerson/Southport and the other County Line quadrant will be ok. And by ok, I mean they will struggle along while I expect Greenwood Park Mall to fully implode. I’ll also add that I’ve started to completely disregard the term “town center” at this point. Hamilton Town Center? Greenwood Town Center? Hilarious. Suburban locations have always played off romanticized visions of urban areas from eras past when coming up with names or concepts. There is a “Greenwood Station” subdivision nearby and don’t forget “The Marketplace” that just opened in Carmel. The funny thing is I don’t think anybody realizes it because any explicit association with anything urban is persona non grata among this demographic. Maybe they would be more successful if they tried to emulate more than just the name. What don’t you like about the town centers? Our family loves them. They make shopping and entertainment so easy and so easy to get back on the highway and go back home. I just find them hokey and lame. Nothing unique or particularly entertaining and I just don’t like to hang out in an environment that is 80% parking lot right off a highway. I prefer to walk or ride to my entertainment/ dining because I find it enjoyable and more relaxing than fighting traffic and parking. That is just personal preference. Town Center development is not good for a city for a number of reasons. It is a feast or famine type of place where it is all or nothing – No slow incremental development to see if an entertainment “district” is really desired. Because of this it is not very reusable like a typical urban building – there are only a limited number of business that will locate and survive there. They are cheaply built with short (30 year) life cycles so they do not create the kind of generational wealth that a well built urban district can create by having a building that will last decades and take on many different forms. It is easily replicated so it will be, they all seem to turn into Lafayette Squares after so much time. The city is left with loads of overbuilt and underfunded infrastructure serving the property. Now, the area can be rebuilt but it will require another massive developer investing large sums of money, if not there is little hope. With an urban space in decline it can be many people investing small sums and leveraging the generational wealth that was built into the fabric to bring the area back to it’s former glory. Urban space is never in decline, really. There’s always room to spread out. And I don’t think you can ever overbuild infrastructure. Nobody ever says a road is too wide. If the mall closes up but we’re left with wide roads, that’s still a big positive. And we LOVE!!!! 80% parking right off a highway!!!!!!!!!! it makes things so easy. We won’t go to a place if there’s ever a concern about parking. About “hokey and lame,” I guess our family finds restaurants, shopping and movie theaters just what we’re looking for. I’m not sure what else should go right next t the Interstate. The problem isn’t the demand. People like shiny new things and wide roads to get to them. The problem is that those free wide roads cost money to build and maintain. And that money has to come from taxes. So if you build too many free wide roads but refuse to pay the taxes necessary to maintain them, what do you get? I’ll give you a hint. The first word of the answer is “infrastructure” and the second word is “crisis”. I feel like we are being troll, big time. How rude. We’re just a minivan Christian family who likes nice retail, easy drive and no parking worries. Sort of like all the other millions of families like ours who also like these destinations. Guess that’s why they build these town centers, for all the families like ours. And just what sort of shopping mall format do you like, Mr. name-caller? Except I won’t call you a troll for where your family likes to go after church. You mean “We’re your average conservative American family that likes its welfare and subsidies but we refuse to call it that or even recognize it because we have no sense of the recent history of development in the US”. IT’S TRUE THAT A LOT of people–MAYBE MOST–think as you do. That fact must be respected if we are to reach consensus as a society. Well, Costco isn’t under construction yet, but it’s close. It’s a shame they couldn’t use any of the former Kroger property in some capacity, but no they have build on completely virgin greenfield just west of the former Kroger. For the record, while that new Kroger is a cool store, that company has a bad track record with leaving behind vacant stores. They will be doing the same soon up at Emerson and Thompson as a new Kroger is being built there too. It took years for the abandoned Kroger at Edgewood and Madison to get re-adapted to something else. The only way this Greenwood Town Center thing “may” work is if the stores are different from what’s being offered at the mall, no duplicates between the two. Otherwise they should just do some sort of office park kind of set up, maybe with some restaurants and hotels similar to McFarland Farms up at the Southport exit. 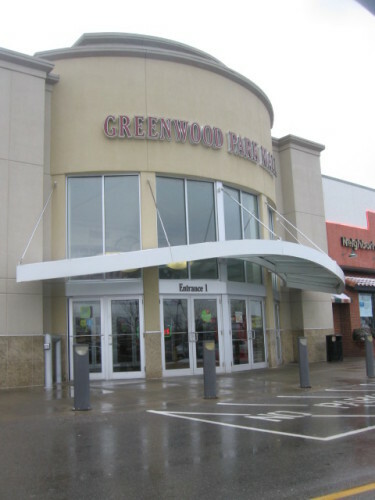 The only thing that goes against the Greenwood mall to me is its location, you have to travel several miles off the interstate on four-lane arterials (except US 31) to reach the mall. While driving in that area has never been a big problem for me, I could see that as an argument against the mall. Castleton, Keystone, Hamilton Town Center and Clay Terrance are all near freeways. A couple weeks back I saw truck roaming around the Costco spot and my mom said they were doing work but I haven’t been back since. I just assumed it was moving along. Thanks for the comments and clarifications, everyone. If a Costco really is ready to break ground, it only raises the further questions: what is the Greenwood area missing that this new development will fulfill? What does the area currently lack that it could reasonably expect to get in the next few years? If it were easier to answer those questions, I’d be less concerned about retail cannibalism, but as it stands, Greenwood and the south side of Indy already have more storefronts than they can support. For examples, check out the northeast corner of Meridian and County Line Road, or the aforementioned Target Square Mall, just north of the Greenwood Park Mall. Since the late 1980s, this is Kroger’s fourth location in that general area along County Line. I read somewhere that the developers are in contact with a few different major retailers. Some of which included: Nordstrom Rack, Dave & Busters, Bass Pro, and I believe a movie theater. Nordstrom Rack would be a good fit for the area considering the only other one in the metro is all the way up near the Fashion Mall. Same goes for Dave & Busters, although Beech Grove has Great Times which is targeted towards children. Bass Pro seems to be something people on the south side want for some reason, so it seems like there would be a strong demand even with Gander Mountain nearby and the Cabella’s that just opened in Noblesville. A movie theater seems kind of excessive since there is a Regal at the Greenwood Park Mall, an AMC IMAX a few miles away, and a “Dollar Movie” also by Greenwood Mall. I’m not a huge fan of suburban sprawl, but if this project is going to be done then it needs to be done right. The developers should add some apartments above some of the shops. A hotel would be ideal too considering its location right off I-65. Office space above some of the shops, or even major office buildings fronting I-65 would also be ideal. Other retailers I could see doing well are: HomeGoods, IKEA, Pottery Barn, Lifestyle Fitness, and Trader Joe’s. This is (a) the best hope for this property, getting some Keystone Crossing exclusive merchants to open their second stores south, and (b) hoped for by many upscale residents of Greenwood, and probably Columbus too. However, this isn’t a good location for those types of stores, which should be on SR135 or near the forthcoming I-69 to serve the upscale unincorporated “Center Grove” census tracts west of “Old Greenwood”. What’s puzzling is that east of this site, clear out to the Indiana Grand casino, it’s just miles of farmland. There’s no “360 degree” market for upscale (or really anything) at that location; it’s not really accessible from Shelbyville (hard 20 mile drive on county roads). It’s a further drive than Southport/Emerson/65 for most of Franklin and Perry Townships of Marion County, so unless Target, Home Depot, Kohl’s, Menards, or Meijer pull out, I don’t see it causing decline there. 20th Century development patterns with their false promise of prosperity, and 20th Century planning and design. Beating a dead horse in my opinion. Sad to see this kind of thinking still going on. It has taken quite awhile for this area to be developed. I definitely think a mixed use development would be the best use. 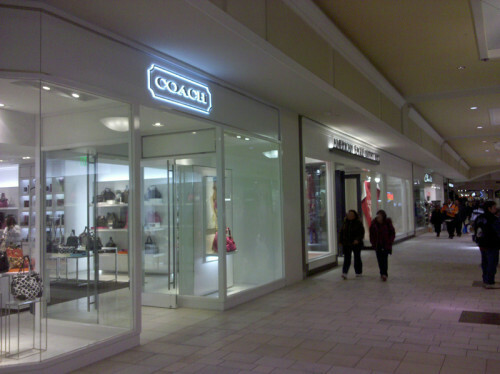 The southside deserves some of the unique northside stores such as Crate and Barrel, Z Gallerie, West Elm, Nordstrom Rack, Container Store. This would be a good location for IKEA. With a large retail development in place, housing will follow. You have it backwards, Bob: the saying in real estate is “retail follows rooftops”. I’m not sure which rooftops the Gershman Partners see. Within a mile or two, I see other retail, an airport, farm fields and warehouses, and some (15-60 year old) ranch house subdivisions. Maybe the developer has a surprise secret “anchor” for the site. Such as IKEA? The easy access and visibility afforded by its adjacency to I-65 makes it a perfect fit within the Indianapolis market. Please stop talking about IKEA. Quick research of where they plant new stores clearly states that Indianapolis is NOT a good fit. BTW: Next time you are in Cincy – count the Indiana plates in the parking lot. Better yet count the 49, 41, 06, 32 and 29’s. In regards to the project – it will be successful in my opinion as the affluent on the south side have been seeking this type of development for years. It is clearly closer than traveling to Keystone at the Crossing or Hamilton Town Center. Now – Simon should take notice – Greenwood and Downtown. And exactly why is IKEA not a good fit in the Indianapolis market? What, we don’t eat eat enough meatballs? Seriously, though, counting Indiana license plates in the Cincy store’s parking lot is hardly serious research. Yes – I am fantastically wrong in regards to my note on IKEA. Fishers? I would have been shocked if it had gone to Greenwood. I’m not shocked Indy is getting one. The Fishers location – at the heavily congested I-69 corridor – doesn’t seem to make sense if you want to attract consumers from surrounding markets up to two hours away. A westside location somewhere along I-465 between I-70 and I-74 would be closer to more shoppers, includng those from the Champaign-Urbana market, the Lafayette and Bloomington markets, and the growing northern suburbs as well. Now, how about a new City Target concept store downtown as the population there continues to gain steam? The company I work for works nationally with IKEA. They have recently started building out into smaller markets and I suspect that the Indianapolis area should expect one in the next 5 years or so. IKEA recently announced plans to build in Columbus Ohio which has very similar demographics to Indianapolis and is closer to the IKEA in Cincinnati location than Indianapolis is. That being said, WHEN they build a store in the Indianapolis area, I’d guess the Castleton area NW/West sides strictly due to serving both Indianapolis and the faster growing counties. Somewhere in Johnson County (between County Line and Whiteland, and between I-69 and I-65, which would broadly include this site) might make sense for IKEA. It would help serve Bloomington and Columbus, just as a NW location would help serve Purdue and a NE location would be closer to Ball State. You don’t say it, but I’d bet that what’s driving a location in C’bus O is The Big University. I love the new mall. I think it’s going to be a great addition to IndyMetro! 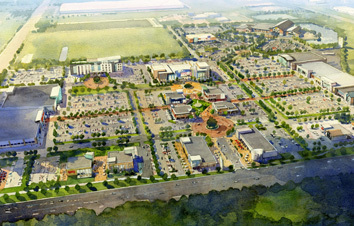 It’s just what Indy needs more of, retail development right on the Interstates. Lafayette Square was nice for a while, but crime, you know? This mall is going to be a great time-saver for families. We just love Hamilton Town Center, but it’s a bit of a drive. I HOPE GREENWOOD GETS A CHUY’S!!!!!!! Thanks again for the discussion. I wish I were more sanguine about the prospects of this development as an economic driver through some retail variant of the multiplier effect, but, as Chris already noted, “retail follows rooftops”. Projects such as these generate statistically insignificant jobs–and they’ll most likely just pinch most of them from somewhere else. East of this spot is nothing but cow pasture, so there’s no real income density. Northern suburbs of Indy can support so much more, because there are so many people at a comparable longitude. Lawrence Township is heavily populated; Franklin Township was almost completely rural until about 20 years ago. Hamilton County has twice the population of Johnson, and while Johnson County grew an impressive 20% from 2000 to 2010, Hamilton grew a staggering 50%. Hamilton County, is by certain per capita income metrics, the wealthiest county in the Midwest right now. 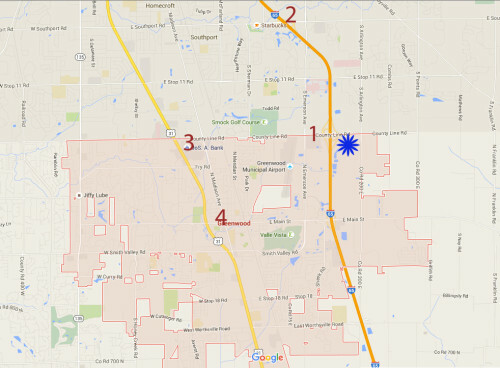 Others have mentioned the Center Grove area as a stronger prospect. While it’s true that one or two census tracts out there to the west of Greenwood probably have household incomes approaching that of Carmel, it’s still a fraction. And people on the south side simply don’t crave luxury spending. There’s a reason Nordstrom and Nordstrom Rack are less than a mile from one another. And none of Indianapolis’ peer cities (Columbus, Nashville, Charlotte, Cincinnati) seem to be able to support a greater volume of high-end shopping than Indy. With all the problems Whole Foods is having, it seems highly unlikely the south side will get one of those–there aren’t even prospects of a Trader Joe’s that I’m aware of. It leads again to the question…what will they put in this shopping center? It’s hard not to imagine at least one department store from Greenwood Park Mall will migrate to the greener pastures. But maybe I’ll stand corrected. I just can’t see a department store bolting from Greenwood. The “agglomeration economies” effect is too great: if you’re shopping for department-store stuff, you’re going to the mall. If Kohl’s bolts, and isn’t next door, you’re not making a special trip to Kohl’s-by-I-65. Same for Best Buy, Bed/Bath/Beyond, etc.